The most complicated thing about moving to Munich is finding a fitting apartment, especially if you are planning to move with a family. As it’s not very easy to find appropriate and affordable accommodation in Munich, you should begin your search as soon as possible. You often need to reply to an offer quickly so it’s advisable to already be in Munich when beginning your search (if only temporarily/in a short term let). So, where to start? Well, it is probably best to start by managing your own expectations, both in terms of budget and apartment size. One will be higher than normal, the other smaller... Other basic considerations to think about include are you looking for furnished or unfurnished, and are you willing to live in shared accommodation? Apartments in Munich typically cost €12 to €16 rent per square meter per month. The more expensive districts are Lehel, Schwabing, Neuhausen, Isavorstadt, Maxvorstadt, Glockenbachviertel, Haidhausen and Altstadt. Still reasonably central but less expensive are Giesing, Sendling, Thalkirchen, Freimann, Bogenhausen, Laim, Gern, Milbertshofen, Berg am Laim and Moosach. Of course, with prices so high, living in the centre is not always an option, and many people find their search takes them into the suburbs. With Munich's excellent transport system, access to an U or S-Bahn station will get you into town quickly, and the prices do go down. Even from S-Bahn stations, the integrated bus network is quite extensive, and the more bus stops you are from the S-Bahn, one can usually see in the rental price. More affordable areas a little further out worth considering include Neuperlach, Haar, Trudering, Harlaching, Forstenried, Obermenzing and Pasing. 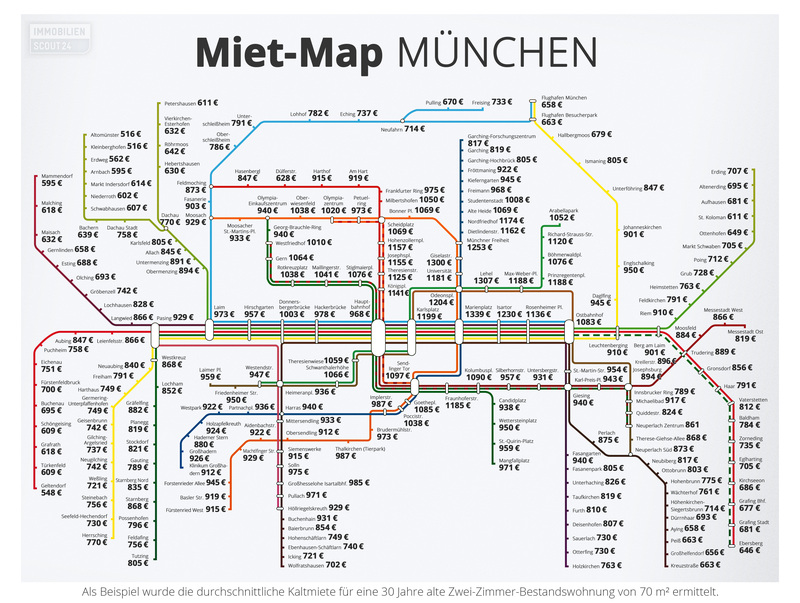 One of the most relevant German real estate websites, Immobilienscout.de, has published a map on which you can find average rent rates for a 70 square metre 2-bedroom apartment at the nearest respective bus, tram or U-Bahn station in Munich. The map is below and the rent shown is “Kaltmiete” (without the cost of heating, gas, water, etc.). While you are looking for an apartment to move permanently to, you could chose to stay at a one or two person apartment from mrlodge.com. A month at one of their apartments will cost you approx. €1,000. Your temporary home comes fully furnished and equipped, so you don’t have to bring anything other than your suitcase. Everything else is provided by the private supplier. From an iron to bed linen and tableware: everything is available. Most apartments also include cable TV, stereo systems, and high-speed internet, as well as a washing machine and often even a dishwasher. Mitwohnzentrale could be the solution for those wanting to stay in Munich for a few weeks or months, for example for an internship. These provide rooms and flats of Munich residents who are temporarily away and make them available for short-term letting. However, this is not necessarily cheap as the agencies charge a commission fee, the cost of which is determined by rental duration and rent cost. The Mitwohnzentrale for Munich. Do you want to move out but not live alone? Then perhaps a room in a shared flat is the solution. It is definitely a relatively cheap option, as all costs are divided among the residents. However, living in a WG isn’t for everyone. You should really think about what living with others will be like and then look for a WG you trust or start searching for student residences in Munich. For such a tech savvy city, it is perhaps somewhat ironic that often the best way to find a place is by one of the oldest means of all - good old fashioned word of mouth. With things moving so quickly, it pays to have as many people as possible keeping their ears to the ground for you. Don't be shy about this - most people in Munich have some experience of what you are about to go through, and the conversation topic of apartment search is a popular one in the city. You'll find WG ofers in any apartment rent sections in newspapers and online. You can begin your search for a permanent apartment at Immonet. Kurz & Fündig, both online and in printed editions - the classified ads paper comes out on Tuesdays and Fridays. The paper costs €2, and there is a premium number to call to get the owner details on the online version. The Friday edition of the main regional newspaper, the Süddeutsche Zeitung, which has a useful classifieds section. One suggestion for being proactive is to place an ad (cost about €11) in this paper, looking for an apartment. The sheer volume of calls a renter will receive if advertising an apartment for rent may make this a more preferable option for finding a tenant for some. Facebook groups such as Munich International Friends, where people often post new room availability! The following link takes you to an Abbreviations and Terminology Glossary in Apartment Hunting which will help you understand the meaning of the common abbreviations used in German apartment ads. A brief explanation of the terminology used can be found in the Important Terminology post.